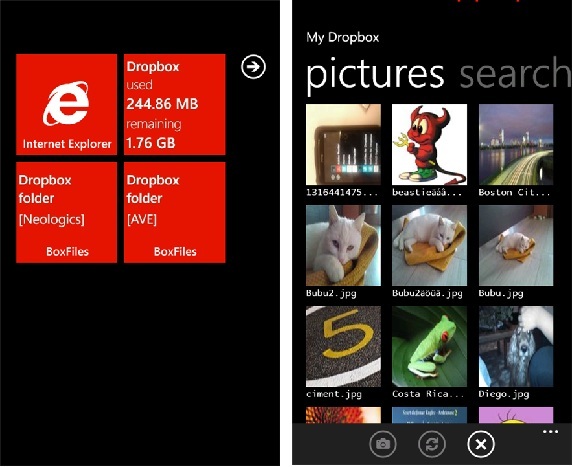 Currently there is no official Dropbox app for Windows Phone devices and so as always, third party applications are the only source of rescue for Windows Phone owners who also use Dropbox regularly. And so there is a third party app called BoxFiles for Dropbox which lets WP users to easily manage, sync and upload their files onto their Dropbox Account. BoxFiles also has the capability to integrate with your Skydrive account and thus allows you to sync and manage files between your Dropbox and Skydrive accounts. Another important feature that BoxFiles packs in is the automatic camera uploads to your Dropbox account. This feature is a blessing in disguise for users who click loads of pictures and also want their mobile to be light on memory. Upload pictures from your Pictures Hub, or use Share to Boxfiles directly from the Pictures Hub, save pictures from Dropbox to your phone. Another good thing about BoxFiles for Dropbox is that the app is Free to Try and you can purchase it later for $1.29. If you wish to try the app, then visit the WMarketplace link here to try it or buy it.